Today I'm super excited to host a fun, literature related giveaway from the talented Mariko of Bouncing Ball Creations! Mariko is a high school English teacher by day and crafter by night, and creates these unique writing utensils from the pages of favorite books. When reading more about her, I also thought it was neat that Mariko meant "bouncing ball" in Japapanese! Cool, huh? And when I saw these pens and pencils I kind of fell in love- I adore writing, and to combine both reading and writing in one cute little utensil? Adorable. Who wouldn't want to write a letter to a friend or even a grocery list with one of these? I think they'd also make the perfect gift for any bookworm in your life, or a completely fabulous finish on a present, wrapped up in the bow. 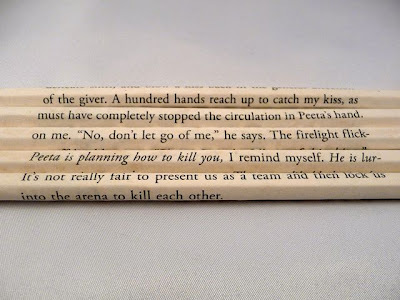 She can also do custom orders using pages from your favorite book. On Monday, June 20th I'll choose 5 winners at random. 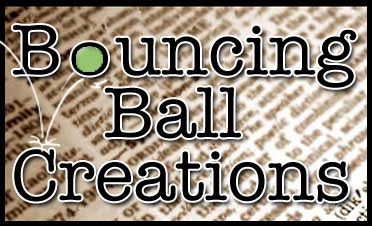 Each winner will receive their choice of a wrapped set from Bouncing Ball Creations! To enter, stop by Mariko's shop then simply leave a comment with your name and email address below. These are adorable, and such a great price! How fun! What a unique idea! Oo - I love these! I love the Romeo & Juliet set! Just checked out her shop and favorited. So clever! Wow, these are incredible! I love how there are different books and plays - I'm thrilled to see Shakespeare there! Totally gorgeous (^_^) Perfect for the stationary/booky geek in all of us! Wow these are awesome. love it! Oh my, these are so good!! She's in my favourites already! For me, it'd have to be a tie between The Secret Garden, the Sheet Music or The Little Prince (as a personalised one, of course). Love it! Be still, my literary heart! Call me nerdy, but a Harry Potter set would make my life! those are all so neat! would make great gifts for new grads too! I cannot stop looking at this shop now, and saying, 'that's amazing, no wait.. that's amazing.' I really need some of these. 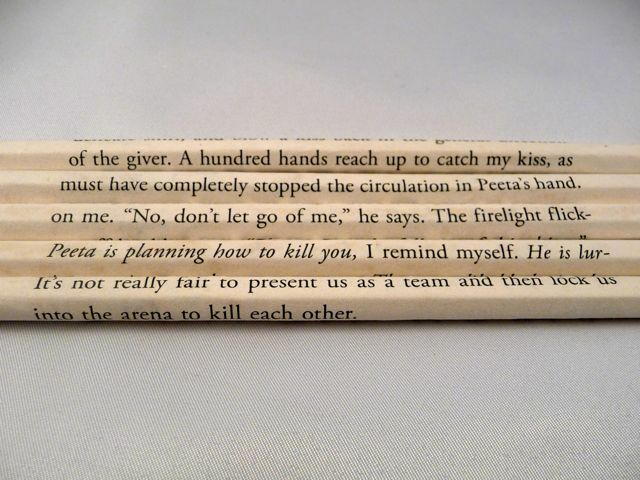 I would definitely want the pen set in the hunger games. I use (and am slightly obsessed with) pens everyday! These are amazing. Thank you so much for making me aware that these exist. Now time to save up. How great are these!! (i secretly love the twilight ones) So unique. I love all of them so cute! this is one of those ideas i wish i had come up with! i'm just glad someone did! i know it's not mandatory but i love the twilight set! Wow these are so cool! Harry Potter is my fave! oh my gosh these are awesome! the harry potter ones got me REALLY excited in a hurry. thanks danielle! What a creative idea! While you write you can look down and be inspired by some of the the most notable authors! Brilliant! so hard to pick a favorite. i think I LOVE the harry potter but I recently finished The Hunger Games and loooooved it. Also, To Kill A Mockingbird!! I'll just take one of each, please. OOO la la! Lovely! I'm excited! Love these def a cute gift idea! Harry Potter, the Hunger Games, Twilight, or Pride and Prejuidce! These are so cute! Love the idea. These are AMAZING! I'm not sure which I would choose!! love these! Romeo and Juliet! amazing. Oh my! I would love to own the To Kill A Mockingbird set, but I would get the Harry Potter set for my friend. She is so Potter-minded that her wedding invitations are going to be just like Hogwarts letters. Oh my! It would be a super hard decision between the Harry Potter ones, or Jane Eyre! So neat! 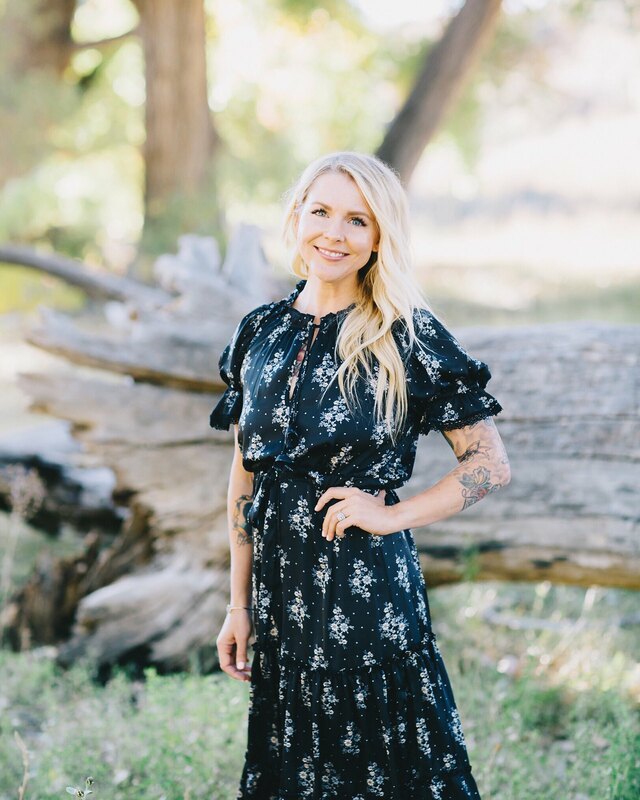 Such a great, unique idea - perfect way to overcome writers block! These pencils are a bookworm's dream! I would love that Harry Potter one! What an amazing giveaway! If I were to win this fabulous givesway, I would want either the Sheet Music pencils, Vintage Vocabulary workbook pencils, Alice Adventures in Wonderland pencils, or The Taming of the Shrew pencils. So original! I love anything that has to do with books. These are great! Love them so much!! Especially the Shakespeare pencils. To die for. I definitely need these in my everyday life - the girls at the office would be so jealous. My eyes may have opened wide and I may have squealed with delight over the Harry Potter set. These are great! The secret middle schooler in me would love those Twilight or Hunger Games pens. Love this idea! oooooooo. Harry Potter pencils! Love it! Great giveaway - I am a writer by day and a reader by night. Needless to say, I am loving these pencils/pens. I have bookmarked this site because it's the perfect gift for my brother's girlfriend! oh my god that harry potter set is too awesome! totally keeping my fingers and toes crossed that i win! Awesome! English teacher over here, and I want some of these! So sweet! Love the Peter Pan set!! Love doesn't even begin to describe it! Seriously, how darling are these? I'd do anything for those Series of Unfortunate Events pencils!! I'm a bookworm! These are perfect. I will certainly be ordering. Oooh. As an English major, I am way too excited about this. I was keeping fingers crossed to see a set for The Bell Jar, but I think A Farewell to Arms suits my fancy! These are AWESOME! I hope I can win! Love the Jane Eyre pencils! wow! I love them all!!! romeo and juliet or alice in wonderland might be my favorites though! Awesome giveaway! Oh my gosh! I love these pencils. Cutest idea ever. Even if I don't win, I'll still be ordering! LOVE THE HARRY POTTER PENCILS!!!!! These are absolutely amazing! I may just have to buy some of my own if I dont win! But I really really hope I do!!!!! I would love a To Kill a Mockingbird Set! So cool! What a fun idea! As an avid writer and reader, this combines two of my favorite things! what a cute idea! Perfect birthday presents! I'm head over heels for the Pride and Prejudice set! LOVE! These are so awesome! So simple and so, so sweet. Those pencils are absolutely positively adorable! I LOVE the Harry Potter ones! Oh this is really very great. Would be such a cool gift for my Mum....I may have to buy some if I win! So cool! What a great Idea! Thank for make me decover it! these will make a perfect present for my sister! i think she will love the secret garden pencils. How amazing are these! Love! I've fallen in love with the Harry Potter ones. Oh my, these are just too lovely! :) such fabulous choice of literature as well. What an artist! Ohmygosh... The Hunger Games set... I die. I need them! i adore the TKAM set, or the alice in wonderland...or my new read, hunger games. seriously...this was made for me to win!! i was an english major. fingers crossed! I love the Harry Potter book 3 ones - even more so that I just finished reading it again! Bah! 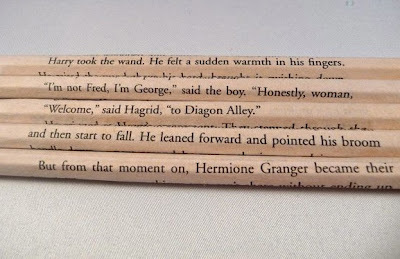 Harry Potter pencils?! I'm in! I'm in LOVE. What a fabulous idea! Ah! Now I love you even more -- just put together that you are a high school English teacher too! I teach eleventh grade lit at a very large OKC high school. AHH!!! Am in love. This is a library nerd's dream... Thanks for the awesome giveaway. These are so darn cute! I would love the TKAM set, or especially a custom set with the Outsiders. Thanks for sharing. p.s. Just found you through a beautiful mess and I'm adding your feed to my reads! Neat!! Really loving each of the Harry Potter sets! Oh my goodness these are darling! I love the sheet music ones. They'd be great for my little sister, she's in drum line at her high school! These are SO cute! I really love The Hunger Games ones... favorite books ever! I just borrowed To Kill A Mockingbird from my neighbor - it is her favorite book and would be the perfect "thank you" gift to send back with the book. What an amazing idea! Mixing reading with writing, my two loves! These are soooo cool! I love them! I would love the Harry Potter set! These are so cool! This is such a cool idea! I would love to win. these are so neat! especially the hp ones! I will never be brave enough to sharpen one of these.. These are absolutely the best! 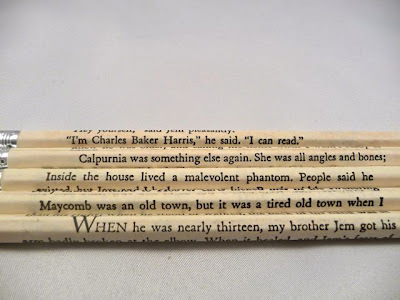 Wow, these great pencils reminded me of some of my favorite books from years ago. Love this idea! We gave these as end of year teacher gifts this year. We asked the teacher what her favorite books were and YAY! Harry Potter was on the list. They were SO well received. I highly recommend Mariko and Bouncing Ball Creations!!!!! She's got some Jane Austen! I'm in!! Love this idea!!! 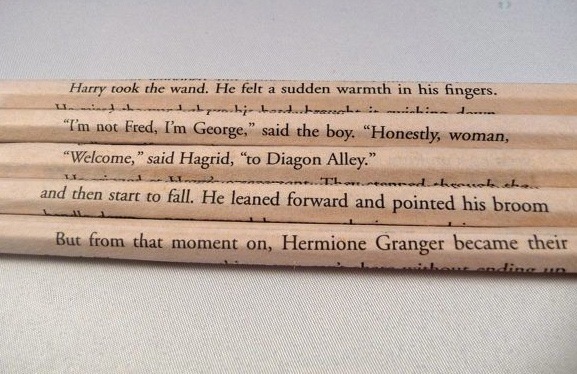 The Harry Potter pencils are making my heart race. What an adorable giveaway! The Harry Potter set would make a really cute gift for my boyfriend's sister. Those are adorable. The Harry Potter one won me over. ^ That's also my name. what a grand idea! they all look awesome. Meghan! I'd love to win, so neat. Ahh these are amazing! Love the Hunger Games ones. Love. These are so clever. These are SO COOL! Fingers crossed! Oh How fun! I would love to have a Harry Potter set! Oh my nerdy heart is bursting at the seams! I love the Through the Looking Glass ones I think. Darling. Oh, the Pride & Prejudice ones! I die! Oh, how wonderful! Thanks for the giveaway! Wow, these are super cool! What a great giveaway! wow! if i recieved those as a gift i would probably cry from happiness!